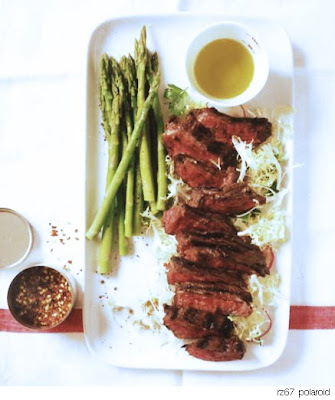 sometimes there's nothing better than a simply marinated & grilled piece of beef - you can put it in a composed salad, make it into a sandwich or just serve it with a drizzle of good olive and some crisp vegetables. we're not grilling outdoors since we moved - maybe cause it's snowing and we don't have a patio anymore - but if you can stand the smoke for a bit, a cast iron grill pan is a great investment. pancakes for breakfast and steak for dinner! this is an easy marinade made special by the addition of two homemade condiments: worcestershire sauce and spicy mustard. by the way, it's our first restaurant week in nyc and although we waited too long to score a coveted reservation anywhere fancy, we did have a wonderful three course lunch here yesterday - we love mario. in a small bowl, combine all ingredients and stir well. place steak in a large ziploc bag and cover with marinade. refrigerate for at least 6 hours or preferably overnight. grill over medium high heat for 8-12 minutes per side, depending on preferred doneness and let rest 5 minutes before slicing. enjoy! You are a peach of a pair! Finally, someone who understands that the point of beef is barely--BARELY--to cook it. Gorgeous stuff here. And don't worry about restaurant week. The fancy places are rarely worth it. I cannot believe it has taken me so long to find your blog...it's incredible and I have some skirt steak in teh freezer! Can't wait to try this out and read more! This looks gorgeous and scrumptious! Would you mind adding details about the salad the steak is bedded on? It looks like frisee/chicory endive and maybe radishes? Keep posting! And thanks!